Where Do Raccoons Go to Find Food? Raccoons in their natural state prefer wooded, forested areas where they can live by a stream and eat insects, but the scavenging creatures are not found exclusively in those environments. Instead, when they venture out in search of food, raccoons often find themselves on human property, knocking over trash cans, causing issues and being a general nuisance. In their natural habitat, raccoons are omnivores and subsist off a diet mostly comprised of small insects and animals found along streams and in forests. Frogs, fish, snails, slugs and insects are the preferred meals for raccoons, along with fruits, vegetables, nuts and seeds. As omnivores, raccoons are capable of eating other animals, typically squirrels, rats and small rodents if they hunt other animals. However, when natural forest area is limited or far away for a raccoon, they will venture out in search of food, bringing them to homes and residences. As scavengers, they dig through trash to eat discarded food and will steal pet food as well. They are generally solitary creatures and will find food on their own, but if an abundance of food is available, many raccoons can be attracted to the area. 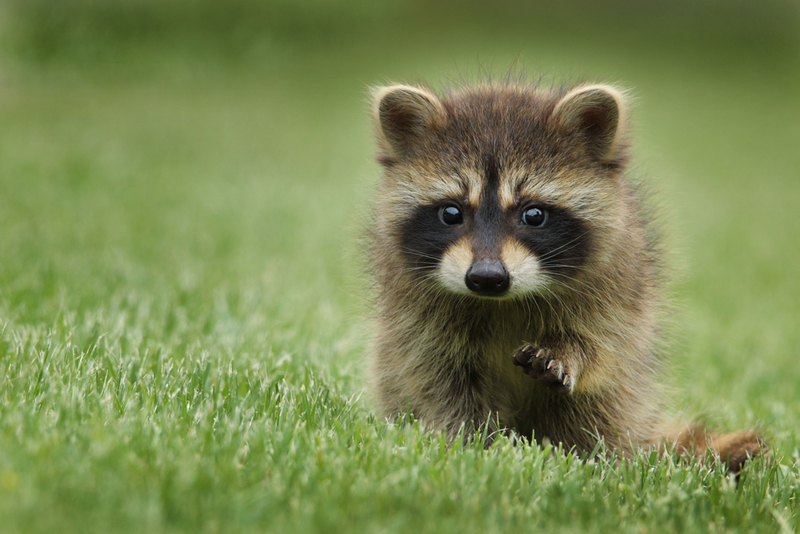 Although racoons are generally scared of humans and pose no threat to personal well-being, they can pose a threat to pets when they are in search of food. Rabbits, chickens and very small cats are only food options for a hungry and desperate raccoon, but it is rare that they would seek out those pets. Raccoons get into issues when they seek out pet food, a much preferable meal than having to attack another animal. Dogs, which are often possessive of their food, have been known to fight unassuming raccoons which come across the dog’s food. Raccoons are known to have high intelligence, and as such, they do not play nice during a fight, especially when faced with an angry dog. When cornered by a dog, raccoons will bite, scratch, try to gouge out eyes and will continue to attack viciously and aggressively until the threat is no wore. When in areas along streams or lakes, raccoons are known for pushing dogs or other animals into the water, causing many other animals to drown. And even after a pet has been wounded, raccoons may still try to attack them anyway out of fear. While raccoons are generally not dangerous to humans and prefer to live away from humans, if you come across a raccoon problem on your property, call the experts at Shumaker Animal Control to deal with the problem for you. Our experienced team will take care of the problem in a timely manner, ensuring that you and your pets are not affected by the raccoons. This entry was posted on Tuesday, December 18th, 2018	at 3:16 pm	. You can follow any responses to this entry through the RSS 2.0	feed. Both comments and pings are currently closed.